The City Council seats for At-large Positions 1-4 will be on the November 8, 2016 general election ballot. Filing for the positions will be from July 23, 2016 to August 22, 2016, from 8 a.m. to 5 p.m., in the office of the City Secretary (City Hall, 1212 Avenue M). 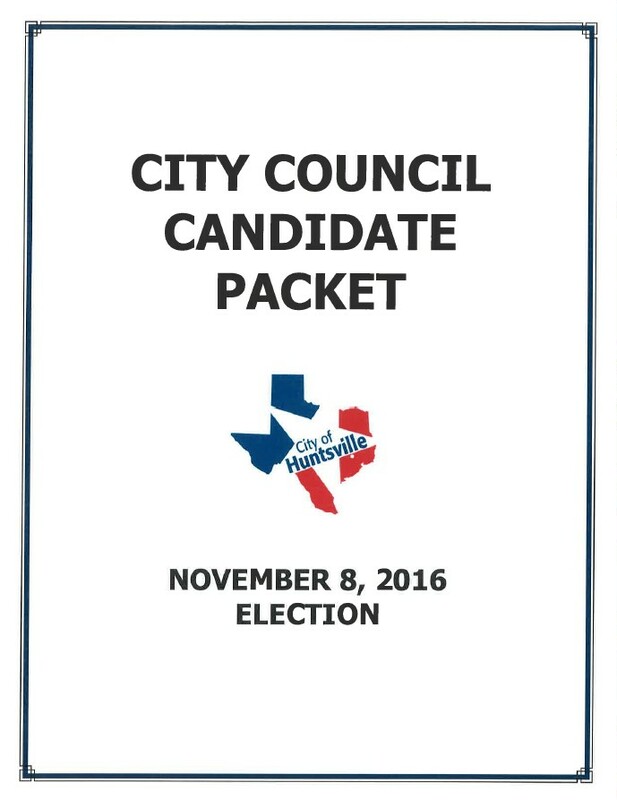 Candidate packets for the 2016 City of Huntsville General Election are available through the office of the City Secretary at City Hall, 1212 Avenue M, or on the City web site at http://www.huntsvilletx.gov/Elections. The City of Huntsville application fee is one dollar, per City Charter mandate. City Secretary Lee Woodward acknowledged members of the public may have questions about the responsibilities of Councilmembers. For more information, email citysecretary@huntsvilletx.gov, call 936-291-5403, or visit the City's Elections page at http://www.huntsvilletx.gov/Elections.